FLORIDA -- An elderly man walking his dog in Little Havana ended up fighting to save his pup from a bigger dog, and the commotion ended with that man given CPR and rushed to Jackson Memorial Hospital in critical condition. Eighty-three-year-old Rogelio Castillo loves his tiny Maltese named Candela. But now Candela has wounds from an attack that never should have happened. It started when Castillo took his pup for a walk Tuesday evening, around his neighborhood. A 9-month-old dog that appears to be a pit bull named King broke away from his leash and went after Candela. An unidentified neighbor saw it all. "When I looked to see why she was screaming, her dog had attacked the old man that lives next door, had attacked his dog," she said. Castillo feared for his dog's life and struggled to separate them. Finally, he got Candela away, but suddenly Castillo was the one in danger. "I heard a loud noise, and he fell and hit the back of his head; he was right there on the gate, and when he did that he grabbed his chest and that's when the lady with the dog upstairs here called 911," said that neighbor. Investigators aren't sure whether he had a heart attack. His family says he has high blood pressure. Christina Morera says she just got King from a friend a week ago. She says he is a pit bull mix that has never shown an aggressive temperament before. "My [Pit Bull] is really good; he's very obedient; I have him upstairs; he's the sweetest dog in the world; his name is King; he's just like a king he sleeps right next to you, takes care of you, the whole nine yards," she told CBS4's Natalia Zea. She can't believe the dog she already loves so much could cause so much harm. "God forbid, I hope nothing happens to the man, I really wish him to get better," said Morera. Morera was given a $500 ticket for failing to register King with the County. Animal Control Investigators say they will do a follow-up visit with her to see if further action is required, and to see if she can legally keep King in Miami-Dade County. 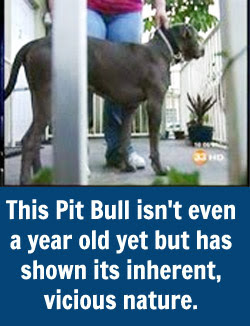 Pit bulls are not allowed here. As for Castillo, his family just hopes he pulls through this, so he can spend more time with his beloved pup. FLORIDA -- A Miami man has been rushed to the hospital after he tried to stop a Pit Bull from mauling his smaller dog. Rogelio Castillo was walking his Maltese near 202 SW 10th Ave. on Tuesday afternoon when a bigger dog launched an attack at the canine. The 71-year-old then tried to get involved and that's when he reportedly was knocked over and hit his head. Neighbors said the man suffered from high blood pressure and could have suffered a stroke. Miami Fire Rescue responded to the scene and rushed Castillo to Jackson Memorial Hospital. His condition is unclear. Police have also not released if the animal involved in the unprovoked attack was a pit bull, a breed that has been banned in Miami-Dade county for years, but has still been responsible for many attacks on pets and humans. Update: It was confirmed to be a Pit Bull which attacked Mr. Castillo and his little dog. The 2-year-old Maltese also needed medical attention after being nearly torn apart by the animal. OREGON -- The case: Washington County sheriff's deputies knocked on the door of Marna Lee Robertson's Cedar Mill home in May and, after searching her home, arrested her on animal neglect charges. Robertson, 68, bred basset hounds at her residence, deputies said, and they went to check on the business after a prospective puppy-purchaser reported the dogs might be living in unhealthy conditions. Animal Control seized all 13 of Robertson's basset hounds and one Lhasa Apso, leaving eight bulldogs in her custody. Authorities said some of the dogs were living in filth and some needed immediate veterinary care. 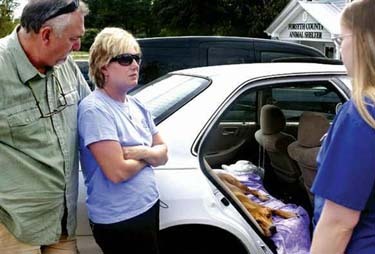 Robertson signed over rights to the 14 dogs seized, authorities said. Update: Robertson was charged in Washington County Circuit Court with three counts of first-degree animal neglect and eight counts of second-degree animal neglect. The court file names 11 canine victims in the case against Robertson. Deputy District Attorney Andrew Freeman said the case was dismissed after Judge Marco Hernandez ruled in August that deputies didn't legally conduct the search that yielded all the evidence in the case. Although Robertson allowed deputies into her home, officers didn't obtain a search warrant and the judge decided Robertson didn't give legal consent, which requires giving permission for a search voluntarily. "It's not a ruling on guilt or innocence," Freeman said, but the decision prohibits prosecution on the grounds of the evidence collected in this case. "In my opinion, (the neglect) happened, obviously," he said. "But as far as whether we can legally go forward, we can't." The 14 dogs Robertson gave up were turned over the Washington County animal shelter, which has since found homes for 10 basset hounds and the Lhasa Apso, said Animal Services Manager Deborah Wood. The shelter sent three of the sickest basset hounds to the Oregon Humane Society, where the animals were treated and have also found homes. 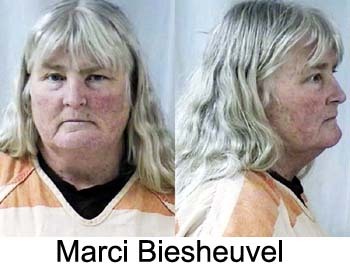 WYOMING -- It's been a month since animal cruelty charges against Marci Biesheuvel were dismissed. Now the 51-year-old woman who runs Litl' Bit of Love Animal Rescue and Sanctuary in rural Carpenter is working to get her nonprofit animal rescue back up and running. During an interview last week, Biesheuvel said she had 20 dogs available for adoption, and she was still at work on a building to house small dogs. On Feb. 24, Laramie County sheriff's deputies and animal control officers came to the rescue with a search warrant alleging filthy conditions in the house where the small dogs were kept. Deputies then arrested Biesheuvel on a charge of resisting arrest. They confiscated more than 100 dogs, cats and rabbits. Before the shelter could seek a court order, Biesheuvel ultimately surrendered the animals to the Cheyenne Animal Shelter. Biesheuvel said last week that she was arrested after asking if she could retrieve her cell phone. She also said no one listened when she asked the officers to take along various medications prescribed for the dogs. She said animals were well-cared for, and she had 250 adoptions last year. "I took animals no one else would take," Biesheuvel said. "Everyone calls me a hoarder, but no one ever asked me how many I adopted out." She relies on donations to run the shelter and has gotten at least one grant, but she also uses her own resources, she said. When she used to work outside the home, for instance, she said she "donated" much of her paycheck to her rescue. When asked how she takes care of herself, she said, "It's not that hard." "You know, if you're paying for utilities in the house and it's for the animals, too, what else do I need? My vehicles are donated. I maintain them." Has she taken in more animals than she can handle, as her critics have alleged? "How many times have you looked in somebody else's eye when they bring you an animal and said, 'Gee, I'm sorry, you're going to have to take them to the Cheyenne Animal Shelter, knowing that they'll put it down.' I did that to a couple people. "I'm a no-kill shelter. The Cheyenne Animal Shelter is not." She cited a case of a woman who owned two dogs: the chocolate lab had attacked and killed the Pomeranian. The owner wanted to find a home for the lab, but was allegedly told by the Cheyenne Animal Shelter they would euthanize the dog. "You look that person in the eyes and tell (her) that the dog (she) had for 10 years has to be put down," Biesheuvel said. "So, how many can you take care of?" Her friend and bookkeeper, Maureen Crea, addressed the dogs cited in the search warrant, which said the small dogs lived in crates in the house. The carriers were so filthy, the search warrant says, urine dripped on the animals below. Crea said it was true they lived in crates. "There was not urine dripping down on anything," she said. "These are crates with solid bottoms." She added that the dogs were let out three times a day for 90-minute stretches, "in shifts, mind you." It was 12 days before the animal control confiscated the dogs. 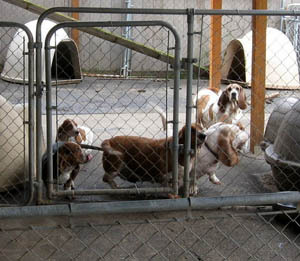 Biesheuvel had taken in a number of small dogs from a breeder from another state. It was what Crea described as a "no win" situation. Originally, she was supposed to get 20 at the most. She ended up with nearly double that because, long story short, the breeder said "you either take all of them or none of them." "So Marci did the only thing I know Marci would do," Crea said. "It was just a matter of either you do or you don't." They kept them in the house because the building wasn't finished yet and it was too cold to keep them outside. Biesheuvel said she was able to adopt out 11 the first week. Her attorney, Michael Bennett, said this is typical of the kind of unwanted pets that Biesheuvel takes in. He said she feeds and shelters them, seeks veterinarian care to alter them and provide medical attention, works on their behavioral problems, and "make them as comfortable as she can" until she finds a new home. "People love warm, soft puppies," Bennett said. "It takes a true animal lover to embrace a 10-year-old mongrel dog with one eye and a surly disposition when he's eating. It's those dogs that Marci is trying to provide a good quality of life as best she can." He went on to say the district attorney's office had done the right thing in dropping the misdemeanor charges against Biesheuvel. State law requires that a veterinarian must determine if the animals are cruelty victims, he said. On that February day, animal control officers wrote the citations without that determination. He also said state law states that animals need adequate food, water and protection from the weather. "If these dogs were in a home, and a home is proper protection from the weather for me, it ought to be all right for dogs and cats," Bennett said. It was those factors that prompted the district attorneys to drop the case, he said, and rightfully so. While other states have regulations for animal shelters and rescues, Wyoming has none. "As long as animals are being fed, watered and have shelter from the weather, there is very little that can be done (to address) the state of the home," Laramie County District Attorney Scott Homar said a month ago. After he announced his office's decision, local animal advocates criticized Homar. But Crea says that once Biesheuvel gets the new building up, and carries out the rest of her vision for her rescue, "It's going to be a wonderful place. 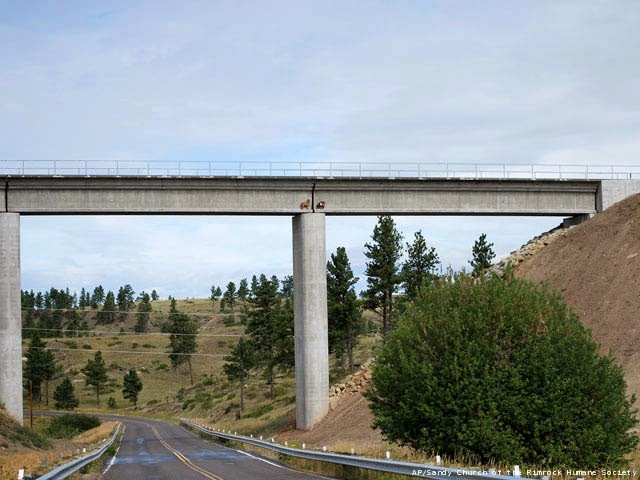 I think it will be the envy of Laramie County." 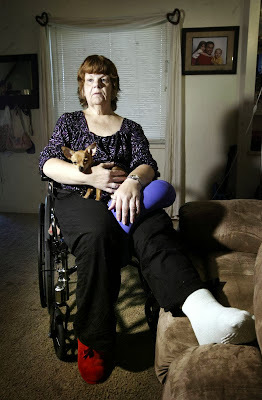 OHIO -- For the first time, the Xenia woman who was attacked by two pit bull dogs, talked about what happened. Linda McGaughey is recovering at her daughter's home. As it turned out, her son-in-law is a recent nursing school graduate and has been nursing her back to help. She is surprisingly upbeat, despite having hundreds of stitches and a lot of pain. "I just prayed. I thought they were going to kill me," said McGaughey. McGaughey talked about the attack Tuesday morning near King and West Second Street in Xenia. She was outside of the John Sale apartment complex, where she works as a property manager and lives. She said she dropped to the ground to try and protected herself and her dog. "It was like a horror movie with them coming at me with their fangs exposed, charging me. It was horrific," Linda said. Someone heard her screams and called police. "I could feel what they were doing to my legs. I just tried not to move the slightest bit, because I thought that would aggravate them and it would get worse," said McGaughey. A Xenia officer shot one of the dogs after it charged at him. The other dog was taken away by animal control. The owner of the pit bulls contacted WHIO-TV and said he felt very sorry about what happened to McGaughey. McGaughey said, "Yes, I fault the owner for not making sure the dogs were properly confined and supervised." The owner told us via email, the he was not at home and the dogs were confined inside, but got out. McGaughey said she deserves more than an apology. "He needs to pay retribution. He needs to be held responsible and accountable," Linda said. The case will likely be review by prosecutors. No charges have been filed. PENNSYLVANIA -- With an obvious love and compassion for her onetime pets, Linda Muchnick says she's prepared to wage a court battle to reclaim the 18 animals she once was accused of trying to poison. "I love them. They are my family. I am one of those people who loves animals more than anything else in the world. That's who I am, who I've been. I don't eat any animal food. I don't wear leather," Muchnick said Wednesday outside a Montgomery County courtroom where she is fighting to have the animals returned to their home. "If I knew that something else would work for them, I would surrender to what's for their highest good. But I know I've got to fight like a proud warrior to recover them all because that's what they need. I truly believe in my heart that's what the Lord wants me to do," Muchnick, sometimes tearful, added during an exclusive interview. The civil hearing, at which Judge Steven T. O'Neill will determine the fate of the 17 cats and one dog, was halted after Muchnick indicated she wishes to call a psychiatrist who evaluated her to testify about her wellness and when prosecutors and the judge indicated they want to hear from members of the Montgomery County Society for the Prevention of Cruelty to Animals regarding the condition of the animals. The animals are currently being housed at an SPCA shelter. "I do believe we need a resolution for the animals involved and for you," O'Neill told a sometimes emotional Muchnick, adding the hearing will resume Oct. 1. 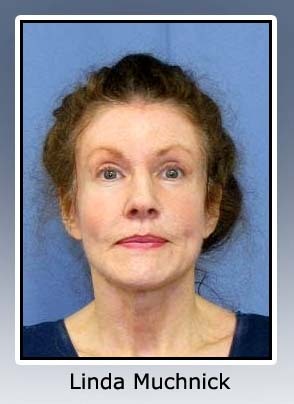 On May, 24, O'Neill determined Muchnick, 57, who currently lives in a one bedroom apartment in Pottstown, was not guilty by reason of insanity of multiple counts of animal cruelty and attempted cruelty to animals in connection with an August 2009 incident at her former Towamencin home. Muchnick subsequently filed court papers to regain custody of the animals. According to testimony Wednesday, the psychiatrist who once offered the opinion that Muchnick was legally insane at the time of the poisoning incident also stated in a March report that Muchnick would not pose harm to the pets if they were returned to her. Prosecutor Abby Silverman argued in court papers that the animals seized from Muchnick constitute "derivative contraband" under the law and that they should not be returned to Muchnick. "No one wants to see any of these animals put down," said Assistant District Attorney John Walko, who assisted Silverman on Wednesday. "But at this time, because of her actions that brought about them being taken away in the first place, we're not confident that they are not in further danger if they were with her." The judge indicated that a previous federal court ruling in a case nearly identical to Muchnick's plight, did uphold the idea that animals are considered "chattel," or tangible property that can be subject to forfeiture. The judge noted that Muchnick is representing herself in the civil matter and questioned her about her lack of legal assistance. Muchnick told the judge she has reached out for assistance and exhausted all possibilities at this time. The SPCA is currently in a holding pattern when it comes to the surviving animals and cannot put them up for adoption either until a judge rules Muchnick can't have the animals or until Muchnick voluntarily relinquishes custody of the animals. While Muchnick is grateful for the shelter and food provided to the animals by the SPCA, she fears for their futures if she is not awarded custody. "They are on the clock for death unless they get a reprieve of adoption," said Muchnick, claiming the SPCA is not a true animal sanctuary. "It's a pound." Muchnick, who has not had any contact with the animals since they were seized, also fears that the animals will be adopted by someone who is not prepared to deal with problems associated with the animals' backgrounds. The animals include a pit pull dog named "Lukey" and more than two-dozen feral cats. "Many of my cats were unwanted. They were all neglected, dumped, unwanted, unclaimed. I took care of everything. I got them spayed and neutered. I kept the families together," said Muchnick, claiming she knows the animals best and is in the best position to care for them. Muchnick said she's found "animal-friendly housing," a supportive landlord and a pet food bank that she can rely on to assist her in caring for the animals. "I can make this work. They mean everything to me. I was willing to go to prison. I was willing to deal with public ridicule," said Muchnick, who could have simply avoided the legal wrangling by signing over her rights to the animals to the SPCA. "I'd never forgive myself if I didn't fight. All I can do is love them." On Wednesday, Muchnick claimed some of the allegations made in public court documents about her were less than accurate and that other circumstances in her life at the time of the incident were not made public. "I always acted in what I thought was their best interests," Muchnick said. OHIO -- New developments in the case of a woman who was mauled by pit bulls Monday night. A man claiming to be the dog's owner sent an E-mail letter to WHIO-TV and said the dogs broke through an exterior wall of the house while he was out of town. The attack happened around 2 a.m. Tuesday morning. Linda McGaughey, 59, was walking her pet chihuahua near King and West Second Street in Xenia. Two pit bulls attacked her and her small dog, she dropped to the ground to protect her pet while the pit bulls mauled her. Xenia police officers called to the scene said one of the officers shot and killed one of the pit bulls when the dog charged him and jumped at him. McGaughey went to Miami Valley Hospital in serious condition with severe bites to both legs and one arm. She's since been upgraded to good condition. Now, Xenia police are looking into a letter sent to WHIO-TV by a man claiming to own the dogs involved in the attack. The man signed the letter with just one name, writing "With my deepest regards, Pet Owner Anthony." In the letter, the alleged owner said, quote, "I am very, very sorry for this unfortunate situation. Unfortunately, I am currently out-of-town on family-related emergency and will be returning as soon as possible tomorrow (Wednesday) morning." The letter writer went on to say,"The police department, from their preliminary investigation, have informed me that although all the proper parameters have been met to properly contain the animals, they seemed to have been worked up enough to have broken through an exterior wall of my home, gaining their freedom." "I am deeply distraught about the event that has occurred and I offer all my prayers and full support for her recovery." Xenia police said they cannot confirm the writer of the letter is actually the dog's owner but they do hope to have the question answered sometime on Wednesday. They may also review their evidence with Greene County prosecutors for potential criminal charges related to the attack. OHIO -- Police in Xenia are investigating after a woman was attacked by two pit bulls early Tuesday morning near the John Sale Apartments on West Second Street. According to police, dispatchers received a call around 1:55 a.m. that a woman was being attacked by the pit bulls. Officers arrived and discovered that the woman was in distress and screaming for help. As the officers began to approach the woman, one of the dogs started to head in the direction of the officers, forcing one of the officers to shoot one of the pit bulls two times. The second dog then ran behind a house that is located on King Street. Medics were called and treated the woman before taking her to Miami Valley Hospital. The second dog was captured by Greene County Animal Control. ”That’s the house they ran behind. We don’t know if they belong there. We couldn’t get anyone to come to the door. They do have a vicious dog sign in the window, but we are unsure if the dog belongs that that house,” Sgt. Chris Stutes said. The victim was identified as Linda McGaughney, 59, of Xenia. She is the apartment manager at John Sale Manor. Police said she was walking her small dog when she was attacked. The victim is listed in good condition Tuesday evening, family members tell Newscenter 7, Linda " has multiple dog bites to her leg and calves, but is happy her Chihuahua was unharmed. " According to Xenia police, it appears that the officers acted appropriately with force to assist the woman who was being attacked and to protect themselves. Investigators said they are still trying to track down the dog's owners. Neither of the pit bulls was wearing tags. GEORGIA -- A 53-year-old man will serve two years in prison for shooting his neighbor’s dog. Jonathan Griswold Hee of Green Summers Drive was convicted last month by a Forsyth County Superior Court jury of aggravated cruelty to animals, reckless conduct, disorderly conduct and discharging a gun near a public street. On Thursday, Forsyth County Superior Court Judge David L. Dickinson sentenced Hee to serve two years in prison and three years on probation. Hee must also pay a $1,500 fine and $551 in restitution, as well as perform community service and undergo a psychological evaluation upon his release. He said the dog came at him and he was scared. Hee has 30 days to appeal the jury’s decision. 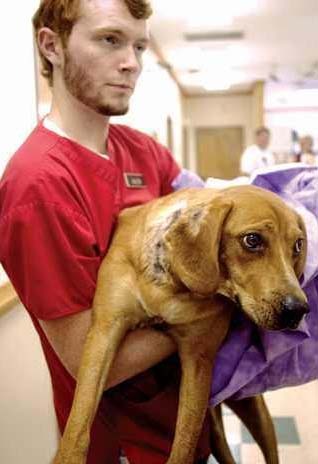 He was arrested in September 2008 by Forsyth County Sheriff’s deputies for shooting his neighbor’s 50-pound Labrador-beagle mix at least twice, wounding the dog’s neck, ear and chest. The dog, named Buster, survived. The shooting occurred on Green Summers Drive in the Green Summers subdivision in northwestern Forsyth. According to a sheriff’s report of the incident, Buster ran out of his yard on Sloan Ridge and approached Hee. The dog’s owner, Laura Hanson, chased after Buster and grabbed his harness. She said Buster barked at Hee because the man yelled at her, the report said. But Hee, who told deputies he was defending himself, fired the weapon. While Buster may be able to perform basic functions, like walking and running, Penn said the dog will never regain 100 percent use of his right front leg. Hanson’s father, John, said the dog hides under a bed when he hears loud noises and sometimes falls because his paw turns under. “Our lives are forever changed and we no longer see our home as the safe haven we thought it was,” he said. 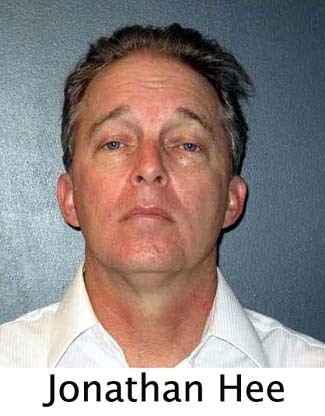 In weighing his client’s punishment, the attorney asked Dickinson to consider the fact the dog survived. “This dog may have some minor nerve damage today, but it can run, it can walk, it can sit,” McFarland said. Some of Hee’s neighbors who spoke on his behalf said he was helpful around the subdivision and had been kind to their families. CALIFORNIA -- A Potter Valley rancher and winemaker will perform 50 hours of community service and give $1,000 to a donkey rescue group in exchange for having misdemeanor animal cruelty charges filed against him dropped. Guinness McFadden also will write a letter acknowledging responsibility and expressing remorse for the negligent care and killing of a donkey he adopted about 30 years ago from the Bureau of Land Management, according to the Mendocino County District Attorney's Office. The donkey had been neglected for years, according to a report by the Mendocino County Sheriff's Office. Its hooves had grown to more than a foot and length, causing them to spiral and curve out at 90 degree angles and forcing the animal to walk on its fetlocks. 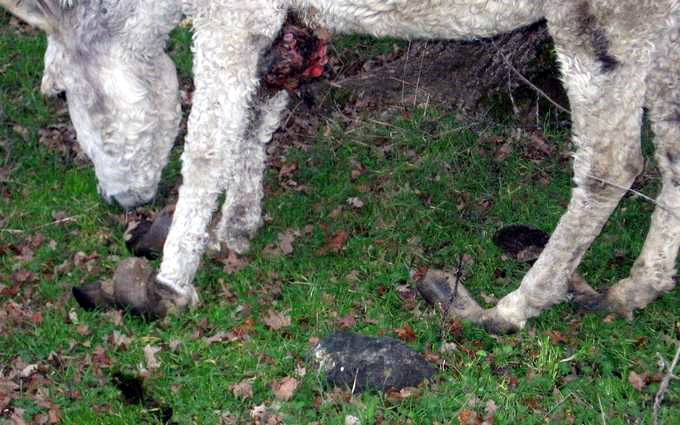 The aging burro also had a volley-ball sized tumor on its side, according to the report. McFadden was charged with animal cruelty earlier this year after he was warned to either get immediate care for the animal or put it down. PG&E workers who operate a hydroelectric facility adjacent to the donkey's pasture alleged McFadden fired multiple shots, wounding the donkey twice before finally killing it. District Attorney Meredith Lintott said the agreement is an appropriate way to settle the case. 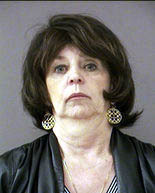 If McFadden, 73, was convicted, he could lose his license to sell alcohol, potentially making it difficult for him to make a living, she stated in a prepared release. McFadden, a Navy veteran, also is community minded and has an otherwise good record of caring for his ranch animals, Lintott stated. That's like saying, "Other than beating this child to death, he has an otherwise good record of caring for his other children." The settlement will become final in 12 months if McFadden complies with the terms of the agreement. WASHINGTON -- The family of a man who died after a dog bite has sued the dog’s owner for wrongful death. 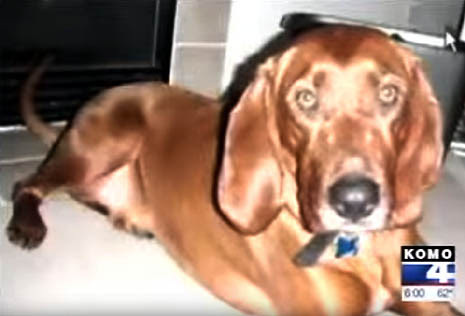 The family of Kenneth Bock claims that dog owner Konrad Haskins was aware that his Redbone Coonhound had a history of biting people, but still let him roam without a leash. Haskins has denied through his lawyer that his dog, Buddy, was off-leash the day Bock was bitten. 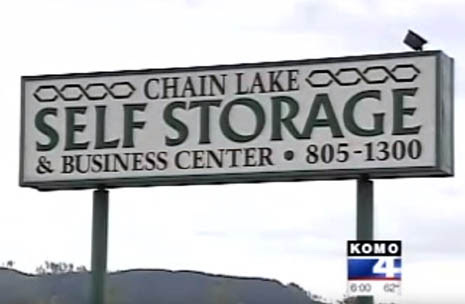 Bock and Haskins were both at Chain Lake Mini-Storage in Monroe in February. According to the lawsuit, filed in Snohomish County Superior Court, Buddy was wandering the property. The dog bit Bock on the finger, drawing blood, said the family’s attorney, Chris Davis. The next day, Bock had severe pain in his leg. He went to the hospital, where doctors found a blood clot that had formed, Davis said. Bock developed an infection doctors diagnosed as Capnocytophaga canimorsus sepsis, a bacterium commonly found in the saliva of cats and dogs, the lawsuit said. 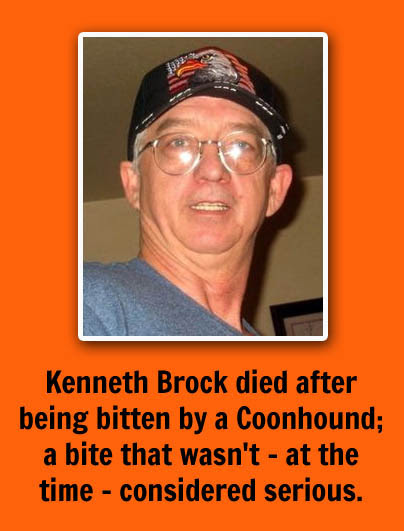 Bock died 10 days after the bite. Haskins’ lawyer, Gary Trabolsi, contends Haskins had put the dog in his SUV, and Bock reached through an open window toward the dog when he was bit. “Before you pet a dog, especially on somebody else’s property, you need to make sure that’s OK with the owner,” Trabolsi said. The dog also bit another person, Daniel Bork, earlier that day at the same place, the lawsuit says. The lawsuit says Haskins paid Bork $100 as compensation. Trabolsi said Haskins did not see any blood or broken skin, but gave him a sanitizer wipe and $20 “for his inconvenience,” not $100. According to state law, Davis said, a dog’s owner can be held civilly responsible if his or her dog bites someone and the owner knew the dog was potentially dangerous. Veterinary records show that the dog bit people as a puppy, Davis said. The owner had the dog put down a week after the bite, Trabolsi said. The lawsuit seeks damages for pain and suffering. The bacterium led to multiple organ failure and tissue necrosis, and Bock died a painful death, essentially rotting to death, Davis said. 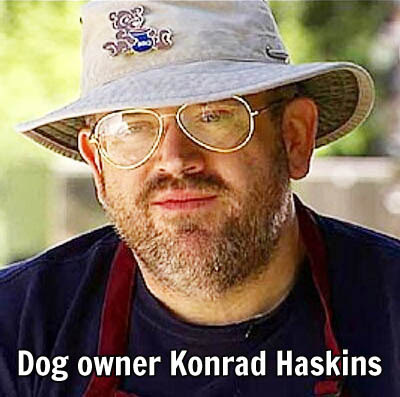 Haskins has a homeowner’s insurance policy and a small-business-owner’s policy for his barbecue business that could cover the death, but Davis said the insurance company has refused to pay the full amount of both policies — about $1.5 million — to the Bock family, so the family decided to sue, Davis said. TENNESSEE -- An 85-year old woman is dead Saturday after being mauled by the family pet. According to police it took bullets from 2 deputies and a neighbor to finally subdue the dog. "It jumped out of the car and I actually helped her get it back in the car," says neighbor Brandon Russell, describing an encounter he had with the dog. "It was a real friendly dog." But Saturday at 151 County 492 in McMinn County, a pit-bull that had been part of the family for 9-years attacked and killed. "I talked to the family members today, and the woman who owns the home," says Russell. "I told her I was very sorry about what happened." It was the 85-year-old mother of the woman who owns the home that was attacked. Family members told Channel 3 off camera that she lives at the home. However, the dog is usually kept outside so the elderly woman was not used to being around the pet. Family members told police they were working in the yard Saturday morning when the attack happened inside. "The daughter of the deceased came running out and got a neighbor," says detective, Eric Allman, with the McMinn County Sheriff's Office.. "She gave him a gun and told him to shoot the dog. All that did was back the dog away a little." Family members say they believe noise from construction work to the roof is what caused the dog to become aggressive enough to attack. "When the first deputy arrived he went inside," says Allman. "The dog was still aggressive at that point. He fired on the dog." It took two police officers and many rounds to finally kill the animal. Russell says when he talked to family members soon after the incident they were beside themselves with grief. "The daughter said she blames herself but it wasn't her fault," the neighbor says. Police say every effort was made to rescue the 85-year-old, but she had already succumbed to her injuries. The McMinn County Sheriff's Office is investigating the incident. Detective Allman says he doesn't expect any charges to be filed. MCMINN COUNTY, TN (WRCB)-- McMinn County Sheriff's Officers responded to a tragic incident Saturday morning after an 85-year-old female was killed by a family-owned pit bull. Police say Mattie Daugherty was killed after her nine-year-old pit bull attacked her inside her home around 11:45. The family told police that the dog would not allow anyone to approach Daugherty and that a neighbor had attempted to shoot it. Officers Randy Gabrel and Tim Davis entered the home and also fired their weapons several times in attempt to rescue the victim. Officer Gabrel risked his own safety and was able to remove the victim from the animal, and additional shots were fired by Officer Davis to finally subdue the dog. Although every effort had been made to rescue the Daugherty, it was apparent that she had already passed away due to her severe wounds. MCSO officers and detectives secured the scene and investigated the incident. No charges have been filed. "This is a sad and tragic incident that bears little explanation," says Sheriff Guy. 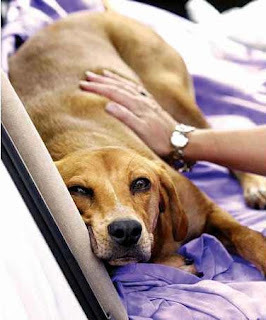 "It was an unfortunate accident involving an animal that the family had owned for many years and had never had problems with. Our thoughts and prayers are with them as they go through this difficult time." 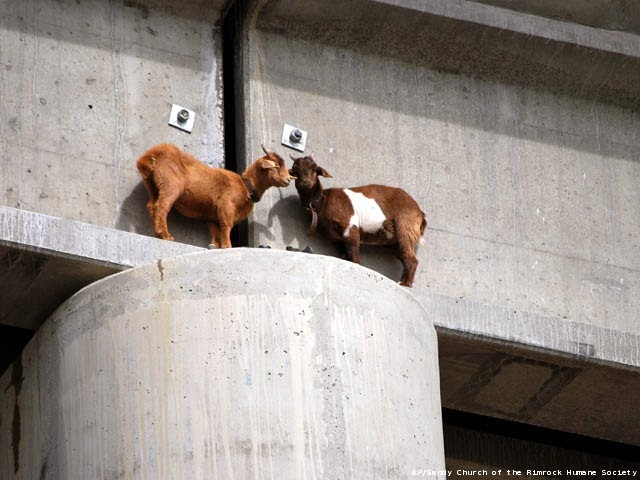 MONTANA -- Two young goats that wandered onto the thin ledge of a railroad bridge and spent two days high above a highway were hungry but safe when they were plucked to safety with a towering cherry picker. The rescue occurred Wednesday 60 feet above a little-trafficked rural roadway in southern Montana between Billings and Roundup, after a caller told the Rimrock Humane Society the goats were stranded on the 6-inch ledge. The young female animals weighing 25 and 35 pounds mostly stayed on the angled ledge, even though there was a wider surface area on a pillar just a few feet away. 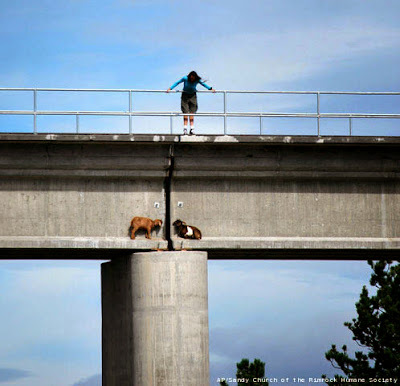 "The whole time, we thought they were going to fall off," said Sandy Church, humane society president. "These guys are just babies." Church said it wasn't clear how the nimble-footed animals got into the predicament, but she speculated they wandered onto the ledge at night then froze after the sun rose and they discovered where they were. The goats sometimes stepped to the pillar to urinate then returned to the narrower ledge, where they tried to rest their tired legs by tucking them under their bodies for a few seconds, she said. Authorities were called Tuesday, when the goats were first spotted. But confusion about the location delayed the rescue until another caller alerted the humane society on Wednesday along with the Musselshell County sheriff's office. The sheriff's office, Church and Cory Freeman, a humane society volunteer who runs the Animal Edventures Sanctuary, enlisted the help of officials at Signal Peak Energy, which operates a nearby coal mine. Mine boss John DeMichiei volunteered mining equipment with an arm high enough to reach the stranded goats that eventually moved to the pillar. "We thought they were going to panic, but it was just the opposite," said Church, who videotaped the five-minute rescue. The rescue went smoothly, and the goats appeared to be in good condition at Freeman's animal sanctuary. The goats had collars around their necks, and Church and Freeman were searching for the owner. Church hoped the animals weren't abandoned. But if they were, she already has talked to people offering to adopt them. "Everybody loves an animal with a story," Church said. OHIO -- The attack happened Thursday in Springfield. The man called authorities, and in the end, three dogs from one owner were hauled away. Animal Resource officers said, even though all three dogs were chained, they were all suffering in one way or another and had to be removed for their own safety and the safety of the neighbors. The three dogs included an Akita and two Pit Bulls. Animal Control officers had trouble getting them under control, even with chains around their necks. Neighbors said they are glad the dogs are no longer a threat. Hargus Wells said, "I'm ecstatic. I was so afraid that kids were gonna get hurt. It's unreal." Another neighbor, Frank Edgington, went to get his own dog after it got loose. He spotted his dog in the backyard where the three aggressive dogs were chained up. Frank said he went into the yard, got his dog, and that's when he was attacked. "I guess I got too close. He attacked me," Edgington said. "I was surprised.". Animal Resource Director James Straley said he doesn't blame Frank. He blames the owner of the chained dogs. "All the dogs had inadequate shelter, no food or water, and not proper confinement," Straley said. The dogs were taken to the shelter until the owner comes in to claim them. It is unclear if any charges will be filed. Frank Edgington's dog bite was not serious. 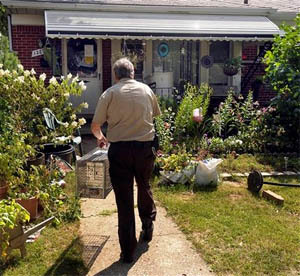 MICHIGAN -- Redford Animal Control officer Allan Perchikoff sets live traps in hopes of nabbing stray cats at a Redford Township home. A woman and her son are facing animal cruelty charges after dozens of animals were seized from their Redford Township home last month. Patricia Wenderski and Eric Wenderski were arraigned in 17th District Court today, according to the Detroit Free Press and WDIV. The Freep says the woman's daughter, who reportedly shared the same home, has not been charged. Officers went to the Wenderskis' home on Aug. 4 after being tipped off by concerned neighbors. One person reportedly complained of a urine odor coming from the house. Animal control officers found more than 30 dogs on the first floor of the home. Authorities also discovered nine cats on the loose and around half a dozen rabbits in the garage, one of which was dead. Redford officials are working to demolish the Wenderskis' house, according to WDIV and the Freep. UNITED KINGDOM -- A TRAUMATISED schoolgirl mauled by a fighting dog has been left too scared to look in the mirror — after the snarling beast ripped open her face in the savage attack. Little Toni Clannachan was pinned to the ground by the vicious American Akita before the brutal animal shook her in its powerful jaws. 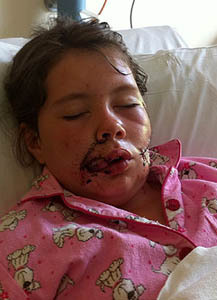 The ten-year-old was rushed to hospital where she is now recovering from her terrifying ordeal. But last night her dad James Dixon told how nurses caring for her have had to cover up all the mirrors on the ward — because the youngster is still too scared to see the effects of the horror attack. Devastated James, 40, said: “She doesn’t want to see her face. She is frightened to go to the toilet in case she sees a mirror. The nurses have covered them up for her. 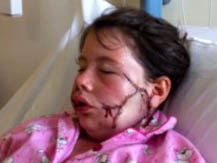 The horror is the second sickening dog attack in a week after ten-year-old Rhianna Kidd was savaged by Rottweilers in Dundee. James told how he had found Toni at the home of the Akita’s owner, Gaynor McCabe, with her 11-year-old son Gabriel and another boy before the horror happened on Tuesday. He said: “The dog was just sitting out the back at the bottom of the garden and the kids were playing quite happily with two ferrets that Gaynor keeps. But moments after James left the house in Kilmarnock, Gabriel’s friend raced after him and told him the powerful beast — named Kruger — had turned on Toni. And the dad was horrified when he saw her devastating injuries. James said: “I’d only got about a hundred yards when the other boy came running after me to tell me the dog had bitten Toni. “I ran back expecting her to have a bite on the arm. But I walked into the front room and she had a tea towel over her mouth, a five-inch hole in her cheek and her bottom lip was hanging off — you could see her teeth. “She wasn’t crying, she was just sitting there in total shock. Gaynor’s mother called an ambulance and Toni was rushed to Crosshouse Hospital. James travelled with his daughter, while an another neighbour told the youngster’s mum Carol Clannachan, 39, what had happened. Ton needed four hours of emergency surgery and around 150 stitches. She spent a night in intensive case before being moved to the children’s ward, where her condition is described as stable. Her parents, who also have 19-year-old daughter Kayleigh, have kept a vigil at her bedside. And James revealed brave Toni has been able to describe the attack to police. He said: “She told me she came to the side of the house to say cheerio to me and as she turned the dog just jumped up and grabbed her by the face. “She said it pinned her to the floor and shook her about. Akitas — originally from Japan — were used to hunt wild animals including BEARS and are fierce fighters. James said he and Carol had read about the previous attack on little Rhianna and called for more to be done about the growing menace of devil dogs. Neighbours in the area said owner Gaynor, 41, ran a dog grooming business but had been warned before about her animal’s behaviour. Strathclyde Police last night said the dog would be held while they investigate the attack. Gaynor refused to answer the door at her semi-detached house.